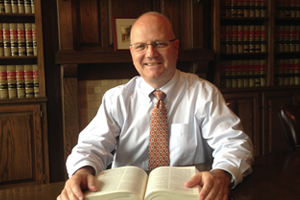 Chris Hopgood, partner in the firm since 1996, received a Bachelor of Business Administration from the University of Kentucky College of Business and Economics in 1984 (with high distinction). He received his Juris Doctor from the University of Kentucky College of Law in 1987 (with distinction). He is a native of Morganfield, Kentucky. While in the College Of Business and Economics, he was a member of Beta Gamma Sigma, and was a member of the Kentucky Law Journal at the College of Law. He is past president of the Henderson Breakfast Lions and the Henderson YMCA. He currently serves on the Henderson Community College Foundation and received the University of Kentucky Alumni Service Award in 2014. He is the moderator and deacon at Community Baptist Church. Chris engages in the general practice of law with an emphasis on utility law and litigation. Chris also has an active probate and real estate practice as well as handling workers’ compensation claims.